The future of television is here, happening all around us. Are we paying enough attention to notice, and if so, is there anything we can do? In his new book Post-TV: Piracy, Cord-Cutting and the Future of Television, Michael Strangelove, who teaches communication at the University of Ottawa, provides a powerful attempt to help us understand this new future. For most of us, TV is still a video-based medium. But this assumption is becoming quickly outdated. Increasingly, the CBC, YouTube, Netflix and The Pirate Bay (an online directory, which, as its name suggests, facilitates peer-to-peer sharing of media content) are all television. 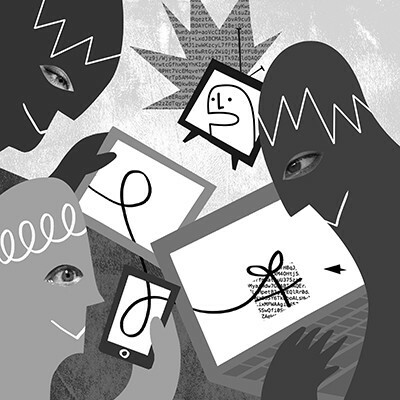 Strangelove is interested in examining how TV is being transformed by the internet. One could argue that the transformative effect works in both directions: the internet is changing TV while TV is changing the internet. New technologies are pushing the boundaries of narrative forms, be it fiction, documentary or news, just as the creators of narrative forms are pushing the technologies beyond their original intent or capabilities. “Television is no longer associated with authorized and regulated production systems, a universal and familiar device, or any device at all,” argues Strangelove. And yet, despite the disappearance of the TV set as a device that we congregate around, we find ourselves in the golden age of television as a medium. And because it is more than just a medium of entertainment or education, it is not just TV going through these growing pains. It is a reflection of who we are, of our society. Therefore, not just TV is changing: so are we. He offers insight and speculation on how that control might be reasserted. In particular he cites the role of software programmers and what he calls adaptive agent designers—services such as Netflix and YouTube, with their reliance upon algorithms to recommend videos for us to watch. Such algorithms mean there will still be curators for content, only now the curators are software-based and more adept than traditional curatorial methods at incorporating the needs and habits of the viewer. To that he cautions that “it is a small step from having our needs served to seeing our actions controlled.” Traditional TV watching was in the privacy of our own home. TV watching on the internet leaves a revealing trail of digital breadcrumbs that not only depict our interests, but in some respects also our entire personality. Strangelove analyzes the phenomenon of piracy from a number of angles, including the way in which technology makes it ludicrously easy to copy. However, he also emphasizes the political dimension: “When millions of young consumers choose to behave in a certain way there is little, if anything, that governments and industry can do.” Strangelove argues that the idea that piracy can be stopped at all is a “statement of faith in the belief system of capitalism” and not grounded in empirical or technical reality. Post-TV presents a smart argument about an ecosystem in shift, but where Strangelove presents the issues facing the industry in a post-TV landscape, he presents few paths forward. Is arguing that piracy has become normal so controversial that it requires such a thorough analysis? Perhaps more controversial, or at least uncomfortable for the traditional powers that be, is the reality that piracy is unavoidable, and entirely new processes, systems and relationships between content consumers and providers need to be established. What Strangelove does well is entirely debunk the industry and government narratives that are biased and not grounded in empirical reality. Where he leaves the reader wanting is in the lack of an articulated alternative or clearly presented argument as to what that alternative could be: What models are being fostered, if not by the traditional television industry, then by parallel industries? In an ecosystem without gates or borders, how can content be monetized? Where is there value, to audiences and users, and to advertisers and brands? What role do community building and fandom have in a sustainable, post-TV ecosystem? And how does the blurring line between viewer and creator affect the relationship between content consumer and content provider, with regards to profit? In an economy where the only constant is change, is television truly doomed, or is it simply evolving, and, if that is the case, how can the surrounding established models and systems evolve in step? Given the proliferation of creators and the richness and variety of content online, the fact that so much of the alternative presented in the book depends upon anonymous internet commentators misses an opportunity to highlight changing practices and emerging communities in the same rigorous manner as Strangelove explains current challenges. On the one hand, it makes sense that the voices of average internet users would help inform and quantify how our viewing habits are changing. Yet the fact that these comments are anonymous seems problematic. Any argument can be backed up by anonymous internet commentators. At one point Strangelove quotes “Baloo, an anonymous Internet commentator.” Yes, it may be too much to source Baloo, and find out who he or she is, and get their consent to comment on the record. But would it not be possible to find other people willing to go on the record and comment on their habits or preferences? At a time when events such as VidCon, a convention for YouTubers, attract tens of thousands of makers, advertisers, broadcasters and agents, the absent voices of these independent creators of online video content feel like the missing link. Just as broadcasters are slowly coming around to televising extreme sports events and video game tournaments, chasing the crowds, and in turn the money, so too is the established world of broadcast looking to the success stories of the digital marketplace to reveal new strategies and best practices. Post-TV could have gone from interesting analysis to essential guide for those struggling to figure out what to do next in the post-TV landscape if Strangelove had talked to those independent creators themselves, to find out why it is such a good time to be doing what they are doing, and what their own independent processes are. Unfortunately, this book, like a lot of academic writing, lacks an evocative narrative. So it is sometimes unclear as to why our relationship with TV has changed. The story is there, along with a smart argument, but the author has not made enough effort to draw things out in a way that presents cause and effect in a domino manner than can inspire action and change. It is only by understanding our relationship with the media we use, and the platforms we engage with, that we can identify new solutions. Our collective love of TV, past and present, is inextricably tied to the human capacity and desire for storytelling, and the story of our relationship with content also holds the key to where content is destined, post-TV. In an era when TV habits are changing, this kind of book needs to be accessible not only to scholars and academics but to practitioners and industry stakeholders as well. As television formats evolve or risk becoming obsolete, so too does the traditional way they are reviewed and analyzed. There is no question that there is a very real need for more research, and more analysis of how our relationship with TV is changing. However that research and work has to be presented in a way that is inclusive of all creators, with an awareness and respect for evolving media publishing practices and standards, so that it is accessible and relevant to the young people who Strangelove claims will revolutionize TV and be the future of media. Ramona Pringle is a professor in the RTA School of Media at Ryerson University and creative director of the Ryerson Transmedia Zone, an incubator for the future of media. She is an interactive producer, creating work for multiple platforms, and a frequent contributor to national media on issues of social media and digital culture.